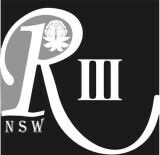 The meetings of the New South Wales Branch of the Richard III Society are held at the Sydney Mechanics’ School of Arts, 280 Pitt Street, CBD, at 14h00 on Saturdays, unless time and venue is otherwise indicated. Why not meet up for a friendly visit before the next meeting? Several members have taken to meeting up for lunch or a coffee before the Branch Meeting at a pleasant, café nearby, just 2 doors down from our meeting place at 276 Pitt Street, called The Walrus Cafe. There are some vegie options on their menu, as well as a delicious all day breakfast, mouthwatering sandwiches, cakes, deserts and great Coffee and Tea, the usual inexpensive and humble café fare. This is not an official Branch event, just a casual, friendly gathering. We usually order a table where there is plenty of room, starting at about 1:00 pm, but feel free to come by any time after that. Hosts: Richard III Society, Victoria Branch, Inc.
For further information and registration forms, please contact our Publications Manager.